Psychoanalysts haven’t been particularly happy with avant-garde art. Even as some have tended to mythologize the artist as a superior being, others have criticized avant-garde art for its regressive nihilism. Thus we have Julia Kristeva’s extravagant, even absurd assertion that “freedom does not seem to exist outside of what we agree to call an ‘artist’.”(1) Erich Fromm goes even further, calling the artist the only “spontaneous…integrated personality”—the very model of mental health, as it were. “Spontaneity is a relatively rare phenomenon in our culture,” Fromm writes, but the artist’s “thinking, feeling, and acting” is a spontaneous expression of himself because he alone has “positive freedom.”(2) This adulatory privileging—idealization—of the artist is not without precedent. Many avant-garde artists agree. Wassily Kandinsky, for example, speaks, with self-congratulatory fervor, of the “unlimited freedom, depth, breadth, a wealth of possibilities” in avant-garde art. (3) Nonetheless, what Kristeva and Fromm write is no more than a theoretical endorsement of the conventional modern idea that the artist is a totally free spirit. And what Kandinsky writes seems more like a fantasy than a fact. Can the artist and art escape every determinism to achieve unconditional freedom? Even the gods are subject to fate. Yet it seems clear that the avant-garde artist is in pursuit of what Meyer Schapiro calls “inner freedom”(4) or an “ideal domain of freedom.”(5) Whether he has found it, as Kristeva, Fromm, and Kandinsky facilely think, is another question. Ai Weiwei’s crabs, Lawrence Weiner’s texts, Michelangelo Pistoletto’s smashed mirrors and Jenny Holzer’s redacted military documents have all given the baroque pile of Blenheim Palace – home to the dukes of Marlborough and birthplace of Winston Churchill – a jolt over the past few years. Inviting living artists to insinuate their works into this world heritage site, major tourist attraction and stately home is one thing. Mounting what the Blenheim Art Foundation insists is the most comprehensive exhibition of Yves Klein in Britain to date is another. The huge rectangle of ultramarine pigment on the floor of the large entrance hall, a recreation of a 1957 Pure Pigment installation, is ravishing – a bottomless visual pool for the eye, thrumming across the floor. Klein died from a heart attack in 1962, at the age of 35. Had he lived, he would have been 90 this year. Later, we come to a large canvas covered in the same adulterated ultramarine, a colour Klein managed to patent as International Klein Blue (IKB). It is his signature colour, representing the void. The void at the heart of this show is also unavoidable. On Wednesday night in New York, 30 art galleries stayed open late to accommodate visitors to the inaugural Chelsea Art Walk, a new initiative spearheaded by the Art Dealers Association of America. It’s a “great example” of how galleries are “finding ways to work together to encourage the public to visit their spaces,” says Andrew Schoelkopf, the association’s president. 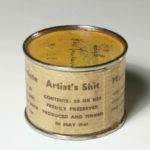 If you read between the lines, it’s also a great example of how New York galleries are pushing vintage approaches to art viewership to fight plummeting foot traffic—a trend that’s threatening not only galleries’ commercial viability, but also their existential purpose as a free place to exhibit art. To people. “I’ve seen attendance diminish a lot,” says Julie Saul, who has run a gallery in Chelsea for the past 18 years. “So about six weeks ago my gallery director said to me, ‘We gotta get some people in here.’” That’s when she called up the Art Dealers Association with the idea for the gallery walk. 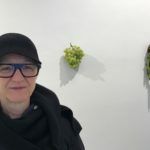 “I don’t think this art walk is going to change anything that significantly,” she says, but special occasions do seem to drive traffic more than mere exhibitions these days. And indeed, the art walk—which also included performances and talks—drew a turnout more typical of the September rush than the dog days of summer. Our columnist follows the bread crumbs left by the rumor that Art Agency, Partners will offer gallery advisory services for a hefty fee. It’s not exactly an analytical breakthrough if I tell you that the art industry is deeply troubled and, in many cases, deeply paranoid right now. A lot of people in the trade feel vulnerable. And the more vulnerable you feel, the more likely you are to lash out at any shadow that looks even vaguely threatening. The perceived scandal in this chatter stemmed from the not-uncommon belief that auction houses have been encroaching further and further into galleries’ and dealers’ territory for years now. The first flash point was the houses’ increased focus on private sales over roughly the past decade. 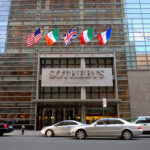 More recently, Sotheby’s in particular has drawn scorn for acquiring AAP in the first place, before AAP attracted even more critics by providing advisory services directly to living artists and estates in 2017. Will a debate over terminology at the Art Gallery of Ontario help the progress of artists who are underrepresented in United States museums? It was a peaceful 1929 image by a national figure, Emily Carr, showing a Mowachaht/Muchalaht settlement she had visited on Vancouver Island. The docent was careful to talk about Carr’s close relationship with “the First Nations,” the popular term in Canada for Indigenous people. With their new online viewing rooms, the mega-galleries are challenging ideas about what can (and can’t) sell online in a changing art market. Galleries have been offering works to buyers digitally since at least the early days of smartphones. 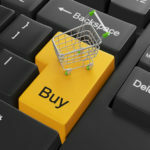 But back then, emailed JPGs and PDF checklists were usually used to whet clients’ appetites for works they would still need to see in person before acquiring. 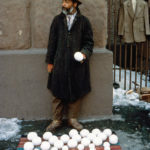 Bruce Hainley on Elena Filipovic’s David Hammons: Bliz-aard Ball Sale. Let that cold open thaw for a minute. Filipovic uses this anecdote to spell out Hammons’s methods, his modes and haunts. Krauss, she writes, “clearly wasn’t looking among the street sellers on the south-east corner of Cooper Square and Astor Place (or, for that matter, taking the ‘funk lessons’ [Piper] was offering that same year). And in light of that startlingly myopic statement by one of the period’s preeminent art historians, one understands better why Hammons felt the need to place himself outside on the street,” where, within spitting distance of Cooper Union, he was teaching advanced lessons on material specificity and conceptual reverb. There is something quietly miraculous about The London Mastaba, Christo and Jeanne-Claude’s 600-ton pyramid-like form that glows red-orange and seemingly sprouts out of its own watery reflections in London’s Serpentine Lake. London is full of verticals, but the glistening structure (on view through September 23) is a matter of horizontals. Rows of 55-gallon barrels laid end to end comprise 90-foot-long flanks sloping at a 60-degree angle, each cylindrical container colored with identical bands of red and white. The rows are minutely off-kilter; the alternating bands that result create a kind of Op Art shimmer. To present 21 works in Hong Kong, spanning approximately six decades (1962–2018), is an unusual occasion for Billy Apple, a groundbreaking New Zealand-born artist whose pop-infused conceptual practice is mostly acknowledged in New Zealand, England (where he studied and worked from 1959 to 1964) and the United States (where he lived from 1964 to 1990). Titled Billy Apple® Six Decades 1962–2018 (9 June–28 July 2018), the exhibition at Rossi & Rossi showcases some of Apple’s dominant artistic preoccupations, selected by Wellington‘s Adam Art Gallery Te Pātaka Toi director Christina Barton. Five categories emerge that circle around the notion of personal identity: the artist’s body; the body’s physical activities; the body’s mental stress; the body/brand and its developing symbols; and the brand as income earner. These groupings approximately parallel the layout of the exhibition. Adrian Piper’s Show at MoMA is the Largest Ever for a Living Artist. Why Hasn’t She Seen It? The conceptual artist’s life and work push against the boundaries of race and identity in America. The wandering artist’s perennial walks have led him to contemplate sun, moon and stars with the devoted awe of mankind’s early ancestors. Mud is not a promising medium to draw with. It is dull, thick, unpromising stuff. A muddy drawing sounds like a vague and boring one. Miraculously, however – or maybe just because he’s spent 50 years making art in and of the land – Richard Long’s huge new mud drawing Gravity Crescent is hypnotic, full of complex 3D curves that snare the eye. It looks as if eels are nesting in the wall. They writhe and wriggle, each tubular body created by a swerve of Long’s mud-stick. 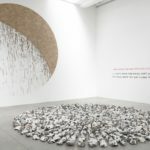 The raw wet earth with which he created this towering work, on a pristine white wall in London’s Lisson Gallery, comes from the river Avon, so perhaps the material is haunted by the river’s flashing, silver-scaled creatures. His muddy swirls mass in an engrossing swarm. The flow and life of the river seems caught in this whirlpool of mud. Gravity Crescent forms part of a vast unfinished circle. Below one section, muddy drips plummet like raindrops. The filled-in segment is crescent-shaped. Is it a croissant? Is it a piece of cake? No, it is the waxing moon. And beneath it, a stone circle fills the floor. It is a perfect disc, made simply by arranging radiating lines of rocks. Once again, Long’s feeling for nature lets him do something artistically magical. The stones are all flints. Their glistening white surfaces shine brightly, set off by flecks of black, to create a dazzling circle of light. It is the sun. Long’s installation is a cosmic picture of the two great discs in the sky. It is as if the megalithic builders of the stone age have set up shop at one of London’s top commercial galleries. With a major retrospective opening in London this week, we focus on a crucial turning point in the career of the pioneering German post-war artist. Joseph Beuys famously declared “every human being is an artist”. The German artist believed creativity to be a universal principle that extends into all areas of human existence, and was thus preoccupied with what he saw as the revolutionary power of art to transform society; if each person is an artist, then society itself is one enormous artwork, continuously being made and remade. An enigmatic, trailblazing and provocative artist, Beuys paved the way for many of his contemporaries in the field of post-war German art. Combining painting, sculpture and performance, Beuys was well known for working with unusual substances, such as fat, felt, copper, sausages, and everyday objects, incorporating the demotic into his exploration of the universal. Karin Sander’s Kitchen Pieces draw your attention to the rhythmic ridges of an acorn squash, the bumpy peel of an orange, and the spiky surface of a yellow dragon fruit. I wanted to write about German artist Karin Sander’s exhibition Kitchen Pieces at Carolina Nitsch in New York from the outset; it’s that novel and striking. The exhibition opened during art fair week, when one gazillion (or more) artworks flooded New York, all competing for attention at the fairs and in exhibitions. Sander’s were among the most startling and compelling I saw — if not the most startling and compelling. I held off writing, though, with the understanding that it is important to note how Sander’s artworks change over time, which they most definitely do. They can be pristine and exquisite, but they also sag, leak, grow brittle, and decay. Sometimes, when they decay too much, they are replaced by fresh versions, which is just fine with the artist. More on this in a minute. For those unfamiliar with Sander’s “Kitchen Pieces,” which have been realized in different incarnations and at different locations since 2012, but not in New York until now, an initial encounter is often marked by wonder and humor, bafflement and unease, because you are not at all sure exactly what you are seeing. Your eyes are enamored, but you don’t trust them. How could a cauliflower be this riveting? How could a single beet be so absolutely compelling? How were they made? What you are seeing looks very familiar, but at the same time strange and unreal. HAARLEM, the Netherlands — Frans Hals, a Dutch Golden Age portraitist of wealthy merchants and jolly rogues, was popular and successful in his lifetime, but before he died, he fell out of fashion. His loose, bold brush strokes were too rough for the 18th century. But the Impressionists rediscovered him in the 19th century, and resurrected Hals as a modern master. Nowadays, Hals ranks with his compatriots Rembrandt and Vermeer in the pantheon of art history, but Ann Demeester, director of the Frans Hals Museum in Haarlem, prefers to see him as a “transhistorical” figure, whose influence leapfrogs across time, and into contemporary art. That is why she has taken the unusual step of rehanging highlights from the museum’s permanent collection of Hals works and other Golden Age art alongside the works of living artists such as the photographer Nina Katchadourian, the multimedia artist Shezad Dawood, and the painter and sculptor Anton Henning, for “Rendezvous with Frans Hals.” She hopes to demonstrate that today’s artists are still inspired by Hals’s 350-year-old legacy. “Transhistorical” is something of a buzz word in curatorial circles these days, as museums seek new ways to ignite public interest in older art. The blending of old and new has drawn interest from collectors at art fairs such as Frieze New York, and auction houses are doing it too: Christie’s sold Leonardo da Vinci’s “Salvator Mundi” in a sale of contemporary art last year for $450 million. She’s an artist and scholar, and at “A Synthesis of Intuitions” you see thinking — about gender, racism, art — happening before your eyes. 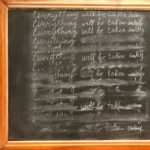 “Adrian Piper: A Synthesis of Intuitions, 1965-2016” at the Museum of Modern Art is a clarifying and complicating 50-year view of a major American artist’s career. It is also an image-altering event for MoMA itself. It makes the museum feel like a more life-engaged institution than the formally polished one we’re accustomed to. Despite the show’s retrospective cast, we find fiery issues of the present — racism, misogyny, xenophobia — burning in MoMA’s pristine galleries. The reality that art and its institutions are political to the core — both for what they do and do not say — comes through. And the museum, for once, seems intent on asserting this. For the first time it has given over all of its sixth floor special exhibition space to a single living artist. The artist so honored is a woman, who has focused on, among many other things, the hard fact of racism and the fiction of race. Ms. Piper was born in New York City in 1948 to parents of mixed racial background. (Her father held two official birth certificates. In one he was designated white, in the other octoroon, one-eighth black.) Raised in a cosmopolitan environment, she studied at the Art Students League in her teens, and in 1966 enrolled at the School of Visual Arts. The MoMA show opens with a salon-style hanging of figurative paintings, including self-portraits, from that time, influenced by 1960 psychedelic graphics and by her youthful experiences with LSD. Decades after giving up the dream for good, an art critic returns to the work he’d devoted his life to, then abandoned — but never really forgot. It pains me to say it, but I am a failed artist. “Pains me” because nothing in my life has given me the boundless psychic bliss of making art for tens of hours at a stretch for a decade in my 20s and 30s, doing it every day and always thinking about it, looking for a voice to fit my own time, imagining scenarios of success and failure, feeling my imagined world and the external one merging in things that I was actually making. Now I live on the other side of the critical screen, and all that language beyond words, all that doctor-shamanism of color, structure, and the mysteries of beauty — is gone. I miss art terribly. I’ve never really talked about my work to anyone. In my writing, I’ve occasionally mentioned bygone times of once being an artist, usually laughingly. Whenever I think of that time, I feel stabs of regret. But once I quit, I quit; I never made art again and never even looked at the work I had made. Until last month, when my editors suggested that I write about my life as a young artist. I was terrified. Also, honestly, elated. No matter how long it’d been — no matter how long I’d come to think of myself fully as a critic, working through the same problems of expression from the other side — I admit I felt a deep-seated thrill hearing someone wanted to look at my work. Of course, I often think that everyone who isn’t making art is a failed artist, even those who never tried. I did try. More than try. I was an artist. Even sometimes a great one, I thought. An inevitable part of being an artist is having to take pictures of what you create, whether in order to digitally submit it for exhibitions or for promotional purposes. Unfortunately, people tend to be too sloppy when photographing artwork, and they often end up with photos that do no justice to the piece itself. This can easily cost the artist a potentially important step in their career as the piece can be overlooked simply because its photo was not up to par with its creative quality. On the other hand, a good photograph of your art can severely increase your chances of getting into an exhibition or making that important sale, so it’s of vital importance to take good shots that will offer a mind-blowing first impression as well as display your overall professionalism. So, although it may seem more like a chore of some kind, photographing artwork is necessary for both entering exhibits and selling work. However, since the process of photographing works of art is far from being straightforward and simple, we’re here to help you avoid all the common pitfalls preventing you from getting the absolute most out of your creation’s images. How this 1916 canvas, included in every major survey of Malevich’s Suprematist works mounted during his lifetime, revolutionised modern art. On 15 May it is offered in the Impressionist and Modern Art Evening Sale in New York. On 17 December 1915, a series of new paintings by the Russo-Polish artist Kazimir Malevich (1878-1935) was exhibited in the Dobychina Art Bureau in the recently renamed city of Petrograd (now Saint Petersburg). Unlike anything Malevich — or indeed any other modern painter — had done before, these geometric, completely abstract works were a shock to everyone who saw them. Indeed, they were so radically new that they seemed to many to announce the end of painting, and perhaps of art itself. Malevich’s Suprematist Composition, painted in 1916, is one of the finest and most complex of these first revolutionary pictures. Composed of numerous coloured, geometric elements, it epitomises the artist’s vision of the world as he believed it would be experienced in a state of higher-dimensional, or ‘supreme’, consciousness. As in his other so-called ‘Suprematist’ pictures, this work does not seek to suggest a real or readily understandable image, but to articulate its own universe, brought into being purely through the act of painting. Asian, postwar, and fine art are by far the most bankable categories in Hong Kong. In recent years, Hong Kong has transformed in the eyes of the Western art industry. Formerly a destination that warranted attention primarily during Art Basel Hong Kong and a few scattered auctions, the region now hosts permanent spaces from many of the most powerful galleries in the world, while Christie’s, Sotheby’s, and Phillips are all seeking to expand their influence there in various ways. So far, this season’s auction results suggest that the market’s steady expansion shows no sign of abating. Sotheby’s Hong Kong closed its main group of spring auctions on April 2 with $466.5 million in reported sales across all categories (and one epic, 40-minute bidding war). The vast majority of the total owed to continued strong performance in fine art sales, which generated just shy of $385 million. While not an all-time high, that haul is among the highest since 2012 (the first year of data available from Hong Kong in the artnet Price Database).